NEW BOOK from Atomic THE MARX ALAMO PLAYSETS DEBUTS AT CHICAGO SHOW! Atomic is pleased to announce our newest and largest addition to our line of books that examine entire lines of Marx playsets. Let us guide you to a look at every Marx Alamo playset of the 50’s, 60’s & 70’s. We’ll help you decide which sets are best for your collection, collecting the entire range, filling out a set with the exact part you need, and gazing with affection at the wonderful cartons, vintage advertisements, and images that so engrained this beloved set into the American consciousness. Every vintage set is chronicled and shown along with boxes, instruction, figures, horses and accessories. 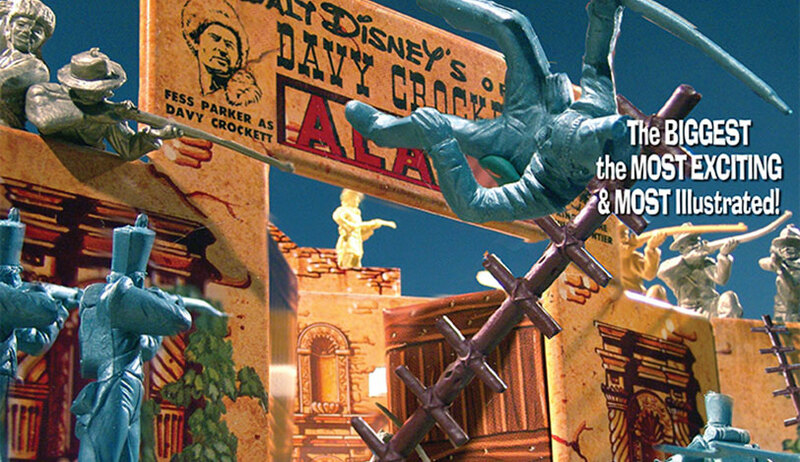 The Marx Alamo also delves deeply into the Walt Disney Davy Crockett phenomena as well as the 1960 John Wayne Alamo and the playsets that are directly related to their pop culture success. Every figure group, horse, wall and accessory is detailed; highly detailed contents lists have been achieved and vetted by the most prominent collectors in the world; and luscious two page photo spreads and all new photos detail these colorful depictions of a crucial history in America. This book is loaded with fully vetted collector information, photos from some of the finest toy photographers in the world so you can submerge yourself in the engrossing fun that is Marx and a world of vintage toys. But then, it’s not just Marx! 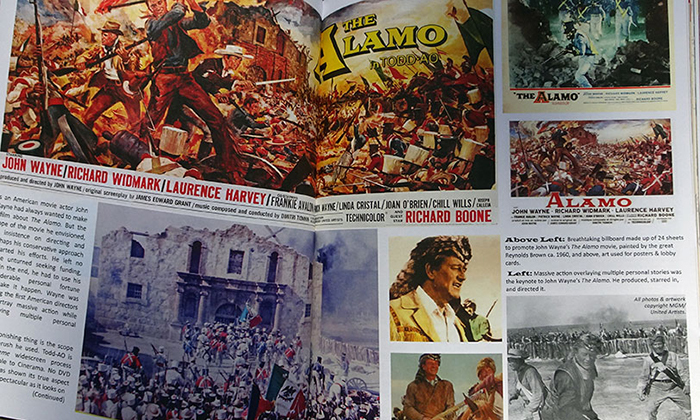 Also here are chapters on Davy Crockett and Alamo toys of the 1950’s and 60’s with many unusual ones highlighted, a chapter on incredible Alamo dioramas by collectors driven to get every facet correct and represent every figure dramatically; the Modern Alamo toys and more. You’ll find yourself going through this treasure again and again! 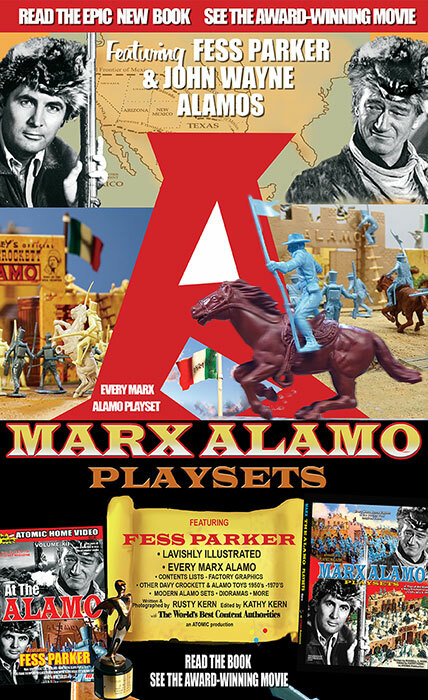 - Lavishly Illustrated - New Photos & 2 page spreads - Every Marx Alamo playset -- 45mm, 54mm, HO - Alamo Toys of the 50’s 60’s & 70’s by many makers - Davy Crockett Toys of 50’s & 60’s by many makers - Contents Lists for every Marx set of the 50’s & 60’s - Collector Dioramas - Factory documents - Alamo history & More! - Our most definitive interview with Fess Parker, Walt Disney’s greatest hero and the focus of the 1955 Davy Crockett hero phenomena. The "Marx Alamo Playsets" book is now available profusely illustrated in two versions: An economical soft cover, and hard cover versions. Each contains the very same dynamically presented information. Soft Cover is $39.95 + Shipping. Deluxe Hard Cover is $59.95 + Shipping (Order with Secure PayPal below), or CONTACT US.